I think no one will argue that knowledge is needed (I mean those who have the definition of “professional”). Do I need a higher education? Here it is possible to discuss. As for knowledge, the answer is quite obvious, in any case, I think so. The question of their quality, depth and breadth is left behind the scenes. Much depends on the context in which they are applied. I propose to talk about the laws related to professional knowledge. And since the field of activity is the determining character of their composition and quality, I will make a reservation at once, it will be about the knowledge of engineers in the system integrator. Situation. It is necessary to understand something. For an engineer in an integrator, the practice is standard. I took a book, read it, opened a profile site, read it, maybe I looked in the forum. It seems to have absorbed all the necessary molecules of knowledge. Got a puzzle in my head. Got it. But is everything correct? And is this enough to understand the picture of the World? How to check? The first option is to ask yourself different questions. Here the main thing before the split personality does not finish. But not everyone can do this. Personally, I have difficulties with this. What else will help? To go to pass the test (the main thing is not blood, although this is also periodically worth doing). Not always applicable, more precisely, even rarely applicable. There is another option – to try to tell someone, for example, a colleague that he has just learned something. This method is effective, because if there are gaps in knowledge on a new topic, during the story they will just pop up. Within the framework of this pattern, we practice internal seminars in our company. The preaching of new technologies to the masses is good. But one more fat plus is getting deeper knowledge in preparation for such a seminar. Understanding that you will need to talk about something new, answer questions, very well stimulates the process of cognition. Moreover, in the course of the seminar, the speaker can understand what else he should pull up. The IT world is transforming and mutating at great speed. All the time there is something new. New technologies, protocols, languages, equipment. Just yesterday, I thought that the software-defined networks (SDN) – it’s something abstruse, invented by Cisco (the author’s opinion may not coincide with the opinion of SDN developers). And today there are a lot of solutions on the market that realize this concept, moreover, Cisco also has such solutions. In IT to sit out sideways not to turn out. If you do not follow the new trends, you will very quickly fly out of the big sport of the clip. The only thing you can do in this situation is to continuously study. Of course, fanaticism is not needed here (although a healthy fanatic is more of a plus). But periodically you need to delve into something new. For example, attend conferences, listen to seminars and stuff. Everyone chooses that way of obtaining knowledge that is most suitable for him (someone well perceives textual information, someone sounds, someone needs pictures). Knowledge has a property to wash out. Being at a peak is not easy. If you do not use any knowledge, they are forgotten. This is the nature of the human brain. Therefore, not only need to understand something, it is necessary to make efforts not to forget it. 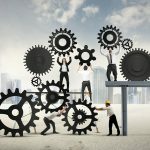 You may also like to read: Software Engineers: What are the software you cannot find out if you are a professional engineer? As it seems to me, the volume of knowledge can be characterized by the following figure. In the process of studying new material, the volume of our knowledge begins to grow rapidly, reaching a certain peak. The peak of knowledge comes at a time when we decide for ourselves that everything is known and it is not necessary to study the subject more. For example, a peak may coincide with the passing of tests to obtain a certificate. After that, the knowledge is washed out. Since in the process of studying we have chosen the “superfluous”, it begins to leave. Of course, the “extra” is not exactly superfluous. Just to figure it out, we have to study the question a little bit more to get the full picture. But since the original purpose was to understand the skeleton and the brain was focused on this, everything else is quickly forgotten. Eventually, we descend to a new base level. At the same time, if you do not periodically remember how our “skeleton” works, we will eventually skip to the initial level. Personally, I support the new basic level helps the periodic passing of certification exams. Often a certificate has a limited duration of action, for example, 2 years. To renew it, you need to retake the exam. An honest preparation for the exam allows you to remember the forgotten material. And this, in turn, ensures the maintenance of the required level of knowledge before the next date of renewal of the certificate. A sclerosis in 30 years? It is worth noting yet another local feature of the previously mentioned regularity. I think everyone fell into a situation when, at some point in time, they thoroughly sorted out a certain question. But time has passed, and before you again the same question arose. Then you realize with horror that you have sclerosis (although it seems that for years there are still not many). You know for sure that you have dealt with this issue, but that you eventually found out, you do not remember. And, well, if the answer to the question is contained in a single source. Usually, it’s easy enough to remember where you looked for it and quickly look at it. Worse, if the answer is spread over many sources and more, it requires, for example, some small testing. Here it becomes more difficult. The first option is to go to a doctor and ask for pills from an IT sclerosis. Oh did not come up with more, then we’ll have to write everything down. Periodically, in the process of learning new things, an interesting situation arises. You find some new information for yourself, almost by accident. And in itself this information has long been known and is not some sort of know-how. Before that, no one asked you about it or just did not have to deal with it in the process of work. Therefore, you never knew the question. But then it became interesting for you (so to speak, just for fun), and you began to study the subject. A week passes and suddenly a colleague or customer asks you a question about this topic. You respond with brilliance, grow in the eyes of the customer or colleague. Everything is super. Although you understand yourself, ask me about this a week earlier, really would not have answered anything. Had to be in an engineer way, hanging on the tube, to search for the requested information. In such a situation, it is hardly possible to study the issue deeply. After that, another short period of time passes and you are asked again for the same topic. And here you are asking yourself a question. Coincidence, magic? That it was not interesting to anyone, but suddenly everyone was interested. Of course, many will stop on the first option, which is a coincidence. But the very perception of this situation is quite interesting. At first I thought that this only happens to me. But then I found out that the same magic happens periodically with my colleagues. But the very perception of this situation is quite interesting. At first I thought that this only happens to me. But then I found out that the same magic happens periodically with my colleagues. But the very perception of this situation is quite interesting. At first I thought that this only happens to me. But then I found out that the same magic happens periodically with my colleagues. We learn best when we are in a good mood. Acquiring knowledge is when our brain is still fresh or most active, for example, in the morning. It is not necessary very long, to study something. It is necessary to take breaks. The brain has the property of getting tired. Do not make big breaks while studying some material. This can spoil the perception of the integrity of the studied subject. I’m sure each of you will add more than one recommendation on the work with knowledge.